686 Ebullient Prism was a Forerunner AI construct, and the Monitor of Line Installation 1-4. Prism's functions included collecting and inspecting any specimens captured for evidence of immunity to infestation by the Flood. Assistance from the specimen when inspecting was not required to be voluntary according to protocol. In 2552, Prism's Gatherers had obtained a member of a respective species that had crashed on the moon, which included Reff 'Talamee, a Sangheili; Black-One, a human; an Unggoy and a Mgalekgolo. Prism introduced himself to the subjects and explained that they were to be vivisected to determine if any of them possessed immunity to the Flood. The Mgalekgolo was vivisected first; although the species was found to be immune to the Flood, Prism stated that they lacked mass and cognitive capability to "satisfy protocol". Prism was about to vivisect Black-One when Reff insisted that the Spartan did not believe in the Great Journey. Prism, interested in Reff's garbled understanding of Forerunner protocol, vivisected the Unggoy instead. Before Prism could continue, he was alerted to the intrusion of the rest of Team Black and Covenant forces, who had formed a temporary alliance to rescue their comrades. Prism remotely hacked into Victor-101's helmet and tricked him into believing that his fellow teammates are Covenant attackers. Prism also sent out a false distress signal to Black-Two, who rushed from the remains of Long Time Coming to the Line Installation, before tricking Victor into shooting her. He also infiltrated Iona's systems through her unsecured "ghost" interface, intending to completely destroy her. Prism chased Iona through Victor's MJOLNIR armor systems, using virtual weapons against her. However, Prism became distracted with a visual depiction of Team Black's training days, composed of data from Victor's partially altered logs. Back in the physical world, Black-One insisted on Prism putting her out of her misery, which the Monitor was gladly willing to accomplish. 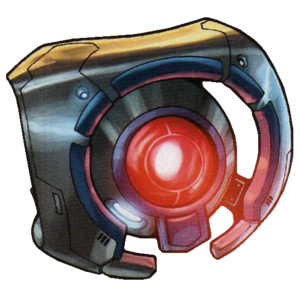 However, Black-One used her helmet to deflect a laser right at her spare ammo pack sitting on a Gatherer, causing it to explode and crash into her cell. She then used the Gatherer's weapon to free Reff. Prism attempted to stop them, only for One to fire at him, forcing Prism to withdraw from Victor's armor. Summoning Sentinels to his aid, Prism chased the Spartan and Sangheili throughout the Installation. One was able to destroy the Sentinels, only for Prism to shoot her down. Reff, taking her weapon, took out Prism's eye, declaring him to be a "false Oracle". They then evaded the Monitor in the Installation's control center. Prism, assembling swarms of Sentinels and Gatherers, soon found them and demanded that they step away from the controls. He vaporized Reff from the legs up, as he was proclaiming about how he was the "Chosen One". Team Black reunited and were able to push Prism back, before using the Installation's main weapon to vaporize the Monitor. Unlike most monitors, Ebullient Prism has a much more hostile demeanor shown by his sadistic pleasure in vivisecting his prisoners. 686 Ebullient Prism shares many similarities with 343 Guilty Spark, the Monitor of Installation 04. Like Guilty Spark, Ebullient Prism has no regard for a being's consent to inspection. After being severely damaged by Reff using a Sentinel beam, Ebullient Prism quoted Guilty Spark; "My eye! Do you mean to blind me?" in a similar situation. 686 Ebullient Prism of Line Installation 1-4. 686 Ebullient Prism uses his integrated beam weapon to destroy Reff. Black-One using a salvaged Gatherer's beam weapon against Prism. Prism is vaporized by the installation's main weapon.